With an influx of 800,000 migrants, per year, and rising steeply, Europe struggles with what to to with the refugees. 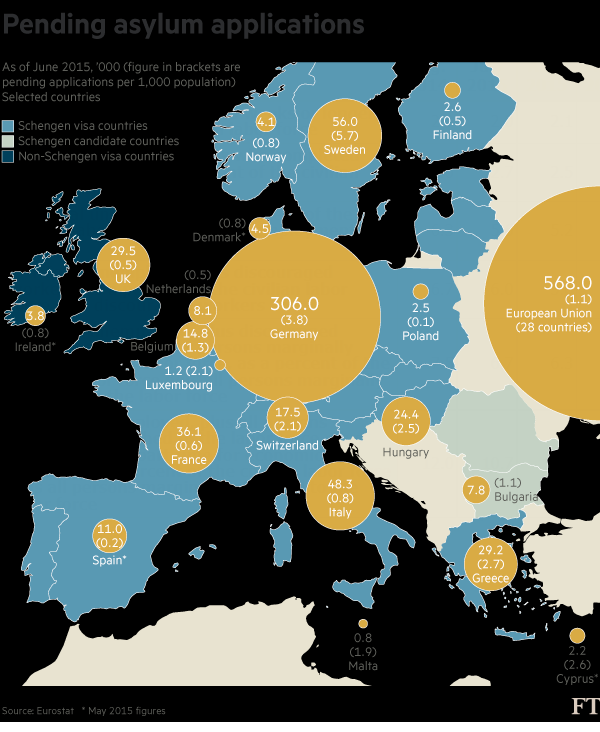 Here's the Migrant Crisis in Numbers. The EU is struggling to respond to a surge of desperate migrants, thousands of whom have perished in their attempts to seek a better life in Europe. Where are they going and where are they coming from? 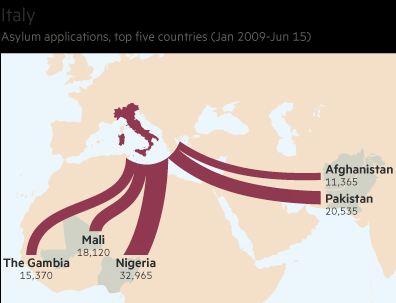 The largest group of people reaching Europe through the Mediterranean or the western Balkans are Syrians fleeing a civil war, but there are also many from Eritrea and Afghanistan, as well as Kosovo and Nigeria. EU rules require refugees apply for asylum in the country in which they first arrive. That is unworkable because nearly all the refugees first arrive in peripheral countries. 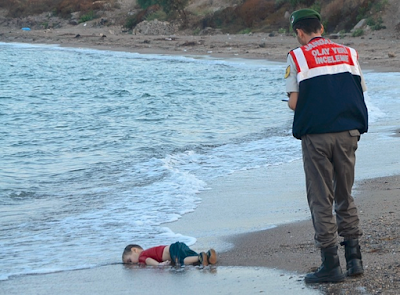 Pictures of mass migration camps did not change sympathies much, but an image of a small child washed up on shore did. For similar reasons, that's why all the hunger donation sites always use an image of a single child for their poster campaigns. With that and other images, German chancellor Angela Merkel sought to shame the UK into taking more refugees. 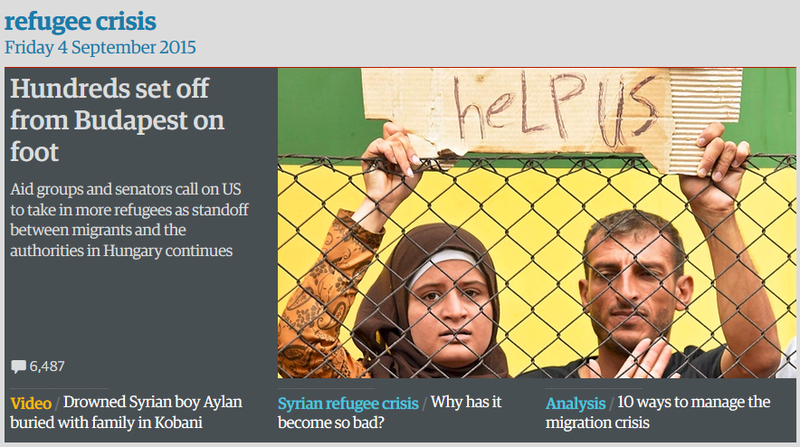 The Financial Times reported EU Leaders Soften Stance on Migrants Amid Harrowing Images. EU leaders began to soften their resistance to sharing the burden of Europe’s migrant crisis, spurred by its harrowing images of human misery, as Brussels prepared a plan to quadruple the number of asylum seekers member states must accept. The shifting stance remained uneven, with some countries in eastern Europe, particularly Hungary, insisting those fleeing the war-torn Middle East and north Africa were still not welcome in Europe and should remain in stable neighbouring countries such as Turkey. Viktor Orban, Hungarian prime minister, said the crisis was “a German problem”. But France said it would now support a push for mandatory quotas on the number of asylum seekers member states would be required to take in. It will make joint proposals with Germany in the coming days. Jean-Claude Juncker, the European Commission president, will next week call for EU countries take in 160,000 migrants from Greece, Italy and Hungary, a fourfold increase on the 40,000 proposed less than two months ago. The most outspoken critic of mandatory relocations has been Mr Orban who has come under intense criticism for erecting a razor-wire fence on his country’s border with Serbia, which has become a major crossing point for Syrians and other refugees fleeing the region. But German chancellor Angela Merkel, who has put intense pressure on other European leaders to be more forthcoming, again laid down the gauntlet, saying all of the EU must be willing to take in more refugees, something that in the past has fallen on only a handful of countries. The curious thing about Orban's detainment policy is the refugees do not want to stay in Hungary. They want to go to Germany. 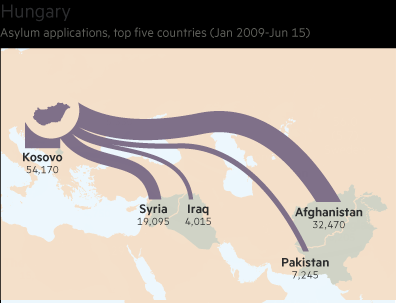 Would Germany be happy if Orban decided to send them on their way? Of course, Juncker wants to force Hungary to accept more. 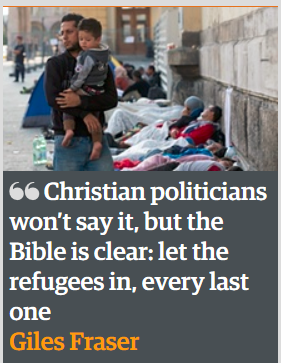 Giles Fraser says the Christian thing to do is "Let Them All In". Al Arabiya reports Egypt Billionaire Offers to Buy Island for Refugees. "Greece or Italy sell me an island, I'll call its independence and host the migrants and provide jobs for them building their new country," he wrote. He is going to provide jobs for them? food? Housing? Tony Abbott has urged Europe to follow Australia’s hardline asylum policy and begin “turning back boats” as a way to stop drownings at sea and smash people-smuggling operations. “It’s obviously a crisis right now on the borders of Europe,” Mr Abbott, Australia’s prime minister, said on Friday. The comments were criticised by human rights advocates, who warn that Australia’s harsh policies force refugees to flee to countries less able to cope with a humanitarian crisis, violate human rights and undermine UN refugee conventions. Mr Abbott was responding to publication of photographs of the body of Aylan Kurdi, the three-year-old Syrian boy washed up on a Turkish beach, and chaotic scenes of migrants in Europe, which is struggling to deal with an influx of asylum seekers fleeing war-torn Syria. When Mr Abbott was elected in September 2013 he deployed the Australian navy to turn boats back into Indonesian waters and began resettling refugees in Cambodia, one of Southeast Asia’s poorest countries. After a bitter debate at its annual conference, Labor supported the controversial “turn back” policy in July. Those who say "let them all in" are good-hearted fools. There is unlimited demand for free services. If countries let them all in, half of Africa would move to Europe. And along with the influx of refugees (none of them with jobs), crime and resentment would build. Unemployment in Greece and Spain is over 20%. Greece is extremely short of funds in case no one noticed. Where is Greece going to put the refugees? At what cost? Who pays? One thing reporters fail to mention is the US role in this mess. US policy created ISIS. Arguably the EU should sue us for damages. What's needed is a stable Syria. Instead, witness scenes like this one. Fox News reports US Monitoring Reports Russia has Stepped up Syria Presence. The White House and State Department said Thursday that it was monitoring reports that Russia is carrying out military operations in Syria's civil war on behalf of President Bashar al-Assad, with both warning that such actions would further destabilize Syria's perilous situation. "Russia has asked for clearances for military flight to Syria," a U.S. official was quoted as telling Britain's Daily Telegraph, "[but] we don't know what their goals are ... Evidence has been inconclusive so far as to what this activity is." Russian military involvement in Syria, if confirmed, would add a new layer of complexity to a war that has killed an estimated 220,000 people and displaced over 4 million, according to United Nations estimates. The conflict has facilitated the rise of the ISIS terror group, drawn in the United States as the head of a coalition launching airstrikes against ISIS, as well as the trainer and supplier of rebel groups who are asked to fight a three-way battle against Assad and ISIS. 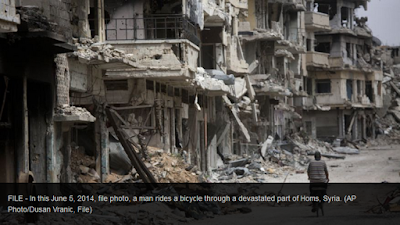 The US claims: "Russia is destabilizing Syria". That's a hoot. 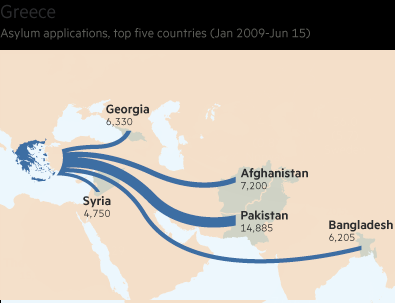 The US is at the heart of a crisis that has displaced over 4 million people. As with Iraq, the US thought it could overthrow a government with no repercussions. So much for another brutal lesson in "nation building" madness.